I asked my sixteen-year-old son if he'd heard that David Bowie had died - and to my astonishment, he had! "Do you know his music?" I then asked. "No," he said. "Do you?" "A bit," I said. "I liked Fame." "Oh, he wrote that?" En-Uk sounded surprised. At first, I was taken aback, but I quickly realized what song he meant. "Not that Fame. An earlier one. 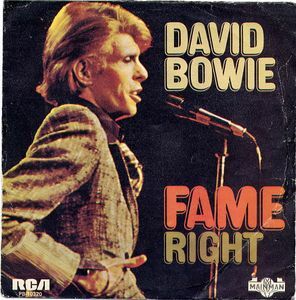 The one I mean came out as a single in 1975, and I first heard it as a freshman at Baylor." I should add, for my readers' edification, that it was recorded by Bowie, but written with Carlos Alomar and John Lennon. I get the impression that rock music just doesn't matter to young people as it did to my generation. From that point of view, Bowie's passing represents the end of an era. He pointed my teenage self to so many things, such as Orwell, Brecht, Burroughs, Warhol, Jung, the Velvet Underground, HP Lovecraft even. He was like some kind of clued up older brother. I don't know if Leonard Cohen counts as rock, but I played his music video "Dance Me to the End of Love" to a class of Westernized Korean students (raised abroad), and they laughed at the 'slowness' of Cohen's song and dance - "Not fast enough," they said. These students wanted fast Korean pop with its quick, synchronized movements. Hmm . . .
Bowie, by the way, seems to have been a decent fellow. Try them with some Napalm Death. There wasn't much napalm . . . in temporal terms.